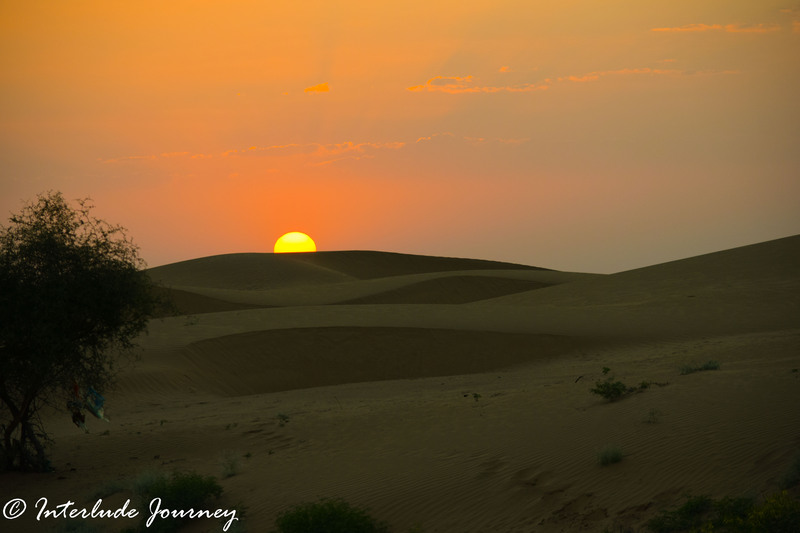 One thing we wanted to experience during our visit to Rajasthan in India was to view a sunset over pristine sand dunes not crowded by tourists. Our host at Chandelao had promised to take us to some dunes which he had discovered on an exploratory trip that he took a few years back. We had to finish our sightseeing in Jodhpur by late afternoon so that we could visit the dunes before evening. After exploring the Mehrangarh fort, Mandore gardens and a few other interesting places in Jodhpur, we headed towards the town of Osian located on the fringes of Thar desert at about 65 km from Jodhpur. Osian, also spelled as Osiyan is a little hamlet known for its temples built in Brahminic and Jain architectural style. It has about 20 temples dedicated to Shiva, Vishnu, and Mahaveera- most of which are in ruins except for the Sachiya Mata temple and the Jain temple of Mahaveera which are still worshiped. The temples of Osian mostly date between the 8th and 11th Century. Osian was initially called Upakesapura and was a major trading center on the Old Silk Route during the Gupta reign. It used to be a major stop for caravans plying on the silk route. Not just that, it was also a major religious center for the Gurjara Pratiharas. However, the glory of the town ended abruptly after it was conquered and destroyed by the Mohamad of Gore in 1195 AD. A couple of small shrines on either side of the road greeted us as we entered the town of Osian. It was evident at the first look that no attempt was made to protect the structures. There were no idols in the shrines and no one guarding the monuments. However, on closer inspection, we noticed that the ceiling and pillars of some of them had beautiful carvings. The town also had a huge step well which was in complete dismay due to lack of maintenance. The famous Sachiya Mata temple was located on a small hill in the town. The temple had ornate pillars built along the steps leading to the main shrine. Most of the walls inside the temple were decorated with beautiful glass inlay work. We could not capture the intricate work as no photography was allowed inside the main shrine. From behind the main shrine, we could view the popular sand dunes of Osian. There were quite a few tourists already riding on the camels. However, we were not heading there. We were destined to visit a much prettier location for the sunset. It was almost 5.00 pm and we had to rush to make it to the dunes before sunset. The greatest challenge we had was to find a jeep to take us to the dunes which were further about 40 km ahead from Osian. Though we had a car, we couldnot take it to the dunes because, as per our host, there was no road to reach the dunes and a 4x drive was needed. We managed to find a jeep driver who agreed to take us to the dunes provided we show him the route. Thus started our journey in search of a place we knew existed but not sure where exactly. What continued was an epic road trip through some of the prettiest villages in Rajasthan. As we drove, we could see the sun descend to the horizon. It felt as if we were chasing the sun to catch him before he disappeared beyond the dunes. There were herds of nilgais( the largest Asian antelope) and chinkaras (Indian Gazelle) on either side of the road. We so wanted to stop and photograph the animals that were fearlessly grazing by the roadside but we could not do so for lack of time. After losing and finding our way multiple times, we finally arrived at Kuntlai Nala just in time before sunset. What we saw was the sunset of a lifetime. I cannot put into words the excitement of having the entire stretch of land all to ourselves. There was not a single soul other than us. There were no camels to ride and no vendors to pester us to buy stuff. The view was overwhelming. The dunes looked as if someone had crafted them in perfect shape. The small shrubs that had grown in patched set a perfect contrast to break the golden hues of sand. The huge star which was racing to descend beyond the horizon before we reached the dunes all of a sudden decided to slow down a bit. We sat there as the big ball of fire disappeared behind the dunes. It was our zen movement and there was nothing to disturb us. The light was perfect for photography but I could not concentrate much on capturing pictures. All I could do was sit there and watch for I was not sure if I would get to see such spectacle again. 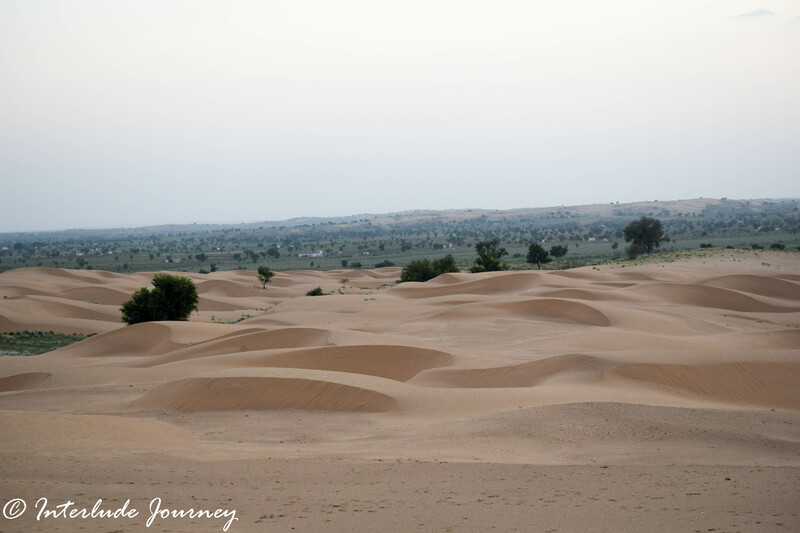 PS: You can find many dunes as you drive from Osian towards Bikaner or Jaisalmer. However, according to our host, the one we visited is very special in its landscape. We would not care to differ because it definitely appeared special to us. Though we do not exactly remember the location of the dunes, we do remember that we had to cross the railway track near the Samrau Railay Station and head west. And then we took a right turn near a school whose compound wall completely covered with sand. Osian is well connected by road and trains and the nearest airport is in Jodhpur. It is best covered on a day trip from Jodhpur. Not many hotels are available for overnight stay at Osiyan. However, there are a couple of desert camps located close to Osian offering basic accommodation. Do let us know how you liked this post. Love it? Here are a couple of pins for your boards. Oh wow! The carvings at Osian are so remarkably intricate! Imagine how much work went into creating that! But how sad that the shrines are not protected and preserved. I just read another blog post wherein some parts of the the temples were vandalized. I find it sad when beautiful artworks like these are not maintained or worse, destroyed. Anyway, that sunset shot that you took is pretty amazing! And the dunes look really peaceful. That is the sad reality, Nadine. Whenever a region is invaded, the first thing to get destroyed will be the monuments that represent the history and culture of the locality. It has been no different in many places across India. The last nail in the coffin is when the locals and visitors do not try to retain or protect whatever has remained. Not sure which I loved more! Those temples have so much intricate detail. On the other hand, that sunset was stunning. What a great day you had! Thankyou Sherianne! It definitely was an eventful day. We would rather wish the location to be off the map 🙂 so that it remains pristine. It’s so great to see things other than the Taj Mahal represented in India! I just can’t believe some of those carvings! If I can risk the food, I might like to go! Thank you, Carly. There is much more to explore in India beyond Taj Mahal. The food is not that bad these days in most of the cities in India. You get cuisines from all across the globe. If food is only the factor stopping you from visiting India, you may want to reconsider your thoughts. Osiyan looks incredible! The sandstone sculptural marvel of both Gujarat and Rajasthan has always blown my mind and this place is no exception. The sand dunes are just so gorgeous!!! Watching the sunset here must have been such an unforgettable experience!! I second your thoughts about the architectural marvels of Rajasthan and Gujarat. I was in Gujarat a couple of months back and the and the structures and intricate carvings just mesmerized me. Thanks, Jesper. I m sure you would love them more when you see them by yourself. Temples in India are really unrivalled anywhere else. The attention to detail and in most cases (although sadly not here!) the level of preservation is incredible. I’ve never heard of Osian before but surely wish I had as I was in Rajasthan last September and it looks like would have been a great place for the sunset! Jodhpur and Jaisalmer are so amazing. I went there for the first time in 2007…then once again..and now I am dying to go back. Your post brought back old and fond memories. I love the carvings of the Jain temples in the region…hats off to the artisans !! I am glad that you finally got to see the sunset over the dunes even though you got lost few times. It definitely looks like a mesmerizing sunset at Osian. I will definitely contact you to know more if I ever manage to go there. I would love to help Soumya. PM me when you need the details. Oh wow, the Osian temples are so intricate and beautiful! The attention to detail is amazing–makes me want to know how long it took to create such a masterpiece. Lastly, I love your photos of the sunset…absolutely stunning! First off, I had to commend you for these beautiful photos especially the sunset shot. The temples of Osian are amazing along with the small shrines. The level of detail and uniformity is beyond anything I’ve seen before and I’ve been to Angkor Wat in Cambodia! Hey Global girl! Thank you for your appreciation. The temples definitely looked special. Very true Carlinn. Watch sunset on the dunes was on of the kind experience. The best thing I could get from your post is that Osian is one of the best non-tourist locations to watch the sunset in Rajasthan. The sunset behind these dunes might be spectacular, that is well clear from your pictures. The Osian temples and the detailing on it too look so intricate. Again the sad part for me is why these heritage properties are not being maintained. Wow the architectural details are insane. So much intricacy in those temples. I wanna visit sand dunes so I can go sand boarding!! The sculptures and temples are just so stunning. I am totally mesmerized by the designs on the temple walls. They are so detailed and bedazzling. The pictures are amazing and the desert looks intimidating but yet beautiful. Hey Guys, True that the architecture was quite intricate on the ruins. The interiors of the Sachiya Mata temples were equally breathtaking. Sad that they do not allow photography inside the main shrine. I have heard alot about this state from India. Heard that this by far is the best state in India to travel. also heard that they are very crowded as well. so good to see these places from your lenses. would love to visit them some day! thanks for sharing. Cheers. Hey Sophie. While I agree Rajasthan is one of the most visited states in India, I wouldn’t agree that it is the best state. The popular tourist destinations are of course flocked with tourists but there are a lot many offbeat destinations which are equally or more charming than the popular cities in Rajasthan. Lucky you were able to find a 4×4 driver to get you to the sand dunes in time for sunset. It sounds like it was a peaceful place with nobody around. Sometimes when I’m in a place like that it feels isolated like this it can be a bit unnerving. Very true Vegans. I would not have dared to venture into the deserted location all alone. You make me feel guilty as a blogger. I have been there but never blogged on this place. Your captures and descriptions have taken me back there again. The detailed sculptural work amazes me. I have missed Osian so many times! Visited Jodhpur twice, and also passed through it once more while reaching Kota from Jaisalmer but could never manage time for Osian! Those temples are just mindblowing. As I always say, I could photograph every square inch of these walls. I wish I knew about Osian when I visited Jodhpur a few years ago. It looks like a wonderful place to explore with stunning architecture. The carvings in the temple are so well made! I have slept in the desert near Bikaner and I can recommend this type of accommodation as it’s a wonderful experience. The pictures you provided left me speechless. I have to visit this place one day, Sindhu! The sculptures and temples architecture are really amazing. I hope i will visit this place one day.